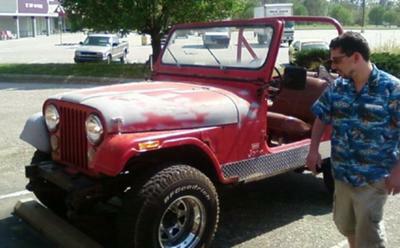 Growing up in Southern PA and going to school in Western PA, I had always wanted an old Jeep. I have cerebral palsy which limits my driving to an automatic transmission. Years went by and one day my buddy said why don't you get a toy. I believe he meant a sports car, but I knew better. So I started looking. I picked up my 1st Jeep (which I later used the AMC 304 with 10,000 miles as my engine for the final project) at Smithfield, NC. I followed my buddy to my house now about 2.5 hrs east. The mechanic looked at the chassis and said that as a friend he wouldn't let me drive it home because it was unsafe. Did that stop me? No. I found Jeep #2 on Craigslist and bought it. Unfortunately the 350 in it was too big and locked up. So someone stopped by and said I'm so-and-so "I can make you a Jeep". Ritchie had a shop in his backyard and slowly he put it back together. I'd stop over and he'd explain every mechanical part possible. Slowly but surely over the next year my "mystery Jeep" was a joke by all. My wife and I were getting married at the Outer Banks in April of this year. Could I offroad yet? Nope. The night before I got married Ritchie drove the Jeep 100 miles on his flatbed to the beach house arriving at 10:30 at night. I felt like a little kid getting his 1st bike on Christmas morning. The following day, I got the LAST beach sticker because drive season ended May 1. After the ceremony my bride and I got into the Jeep parked on the beach and drove off. If living in NC is like Dukes of Hazzard, then I have definitely found my "Cooter" mechanic. 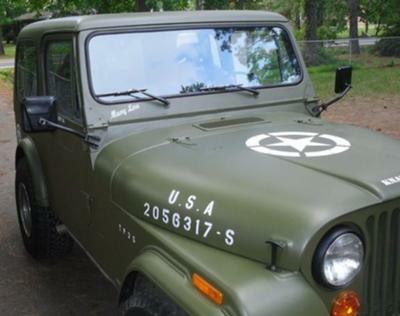 Larry's Comment: Great story, Jason...but where I come from my wife would need to be willing to change her name to "Mary Lou"...or I had better stencil her given name over Mary Lou's on the Jeep...ha!